Former meth addict and Narconon Graduate urges parents; "Before school starts I hope parents will take time to talk to their kids about the dangers of drugs to health and goals." "August marks our daughter's fifth year since conquering meth at Narconon California" comments Susan, mother of five and teacher who recalls living with a meth addict; "One day she'd be very nice and the next you'd have thought Satan walked through the door." A middle-class family, active in their church with no history of drug or alcohol abuse in the family... until their daughter's. An honor student active in sports, Edee earned a collage scholarship. But three weeks after high school graduation a close friend died of an overdose. Susan recalls "Edee shared with me years later; she wanted to experience what her friend had. So began two years of hell-raising. She tried ecstasy, heroin, cocaine, alcohol & smoking. Meth hooked her." "For a while we didn't know what was wrong. She was short-tempered, couldn't hold a job. Out all night, sleep all day; stopped going to church. Finally we realized: drugs! You worry all the time. Will she kill herself, or someone else? Edee tried a 28-day program. It replaced illegal drugs with legal drugs. She reverted." added Susan. Edee's grandmother continued searching the internet and found Narconon California, a drug-free life skills program. "What impressed us," Susan says, "was the sauna part; drugs are sweated out of the body. Edee told me she could see sticky tar coming out in her sweat. This helped eliminate physical cravings." "Soon after arriving, Edee wanted to go to church, the staff was happy to take her. With the local Bishop and congregation helping, Edee rediscovered her faith. Today she enjoys full fellowship with her church" says her proud mother. "She's been working ever since, paying us back and now happily married." 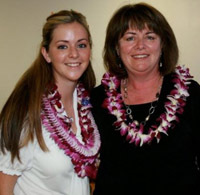 Susan makes time for drug education and answers questions from parents of addicts. "Narconon saved my daughters' life!" Daughter Edee adds: "Before school starts I hope parents will talk to their kids about the dangers of drugs to health and goals. And Mom — thank you, for going through all you had to with my addiction, for believing in me, and getting me help. Our relationship is better than ever. You are my best friend!"